I recently had the privilege of facilitating a “writing through grief” workshop at our Kit Boney Grief Center. 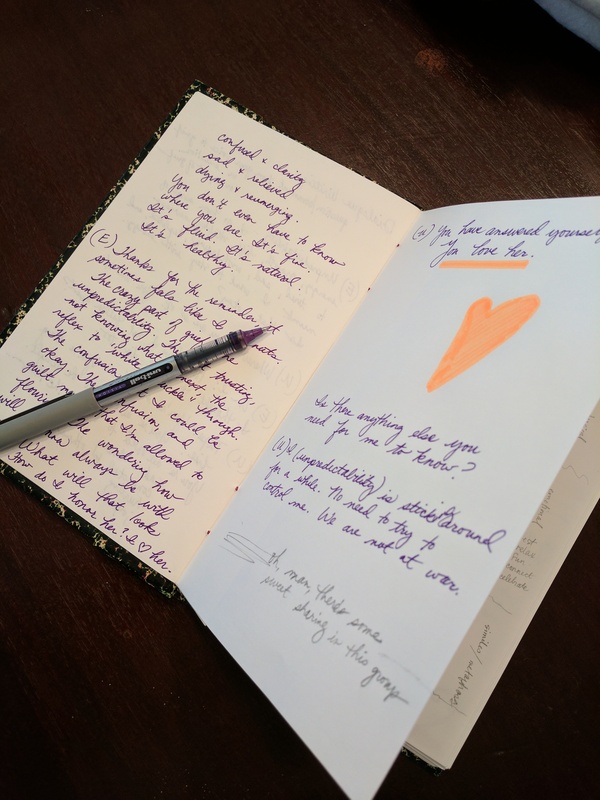 Participants were guided through a variety of writing exercises to encourage reflection on their experiences of grief—acknowledging what is lost while also affirming all that endures. Workshop participants gave voice to the pain of their losses, as well as courage, resilience, and perseverance discovered in the midst of loss. Me: I regret maybe resent his illness because I could never fully resolve his fears and his questioning and sometimes desire to leave. Regret: Remember how the ‘forgetting disease”works. He never mentioned regrets, only frustrations that he couldn’t do his work or even the simplest things. Me: Yes, the only one he mentioned was how demeaning it was to him that I had to hand him his pills and tell them to put the pills in his mouth before taking a swallow of water. Regret: His independence was cruelly compromised. Me: I had to learn to be patient and more giving than I ever knew I could be. I never really had a chance to say goodbye to his damaged mind. Regret: Yes, now that seems to be your biggest regret. Me: How do I overcome this? Regret: Hold it in your heart and know that he was feeling this deep down but couldn’t get it out. Me: How desperately sad. Is there anything else for me to know? Regret. That you did the most you could. That your last months were the greatest love and understanding between you both as he prepared to leave this earth. Me: Unpredictability, I go from a surge of energy, growth, life, vitality, newness to tired, sad, withdrawn, depleted, and numb. I want to stay with energy. Is that okay? Unpredictability: Wherever you are is okay. You are okay. Me: Am I? How have I not fallen apart? I thought I would die too. Unpredictability: Nope. You’re still here. You’re doing fine. You’re allowed to be all right. You’re allowed to be all the things…sad/lonely and connected to others…hurting and joyful…confused and with clarity; sad and relieved; dying and reemerging. You don’t even have to know where you are. It’s fine. It’s fluid. It’s natural. It’s healthy. Me: Thanks for the reminder; it sometimes feels like I am nuts. The crazy part of grief. The unpredictability. The not trusting, not knowing what is next, the reflex to “white knuckle” through. The confusion that I could be okay. The confusion, and guilt maybe, that I am allowed to flourish. The wondering how will my sister always be with me. What will that look like? How do I honor her? I love her! Unpredictability: You have answered yourself. You love her. Me: Is there anything else you need for me to know? Unpredictability: I am sticking around for a while. No need to try to control me. We are not at war. Step into your vulnerability and grief. There is goodness in not hardening your heart. Only then can you see your heart truly—and then respond to it and nurture it. One day then perhaps you will find your playfulness, your laughter, joy, and even the wild. Life—to live again fully and freely. Life—to be bold again and feel my heart beat again. When one participant was asked how it felt to hear herself reading her words aloud, she responded emphatically, “It felt like the truth!” I am humbled by the wisdom, richness, and depth of the writings produced during this writing workshop, and especially grateful to those who granted me permission to share samples of their writing here. My hope is that their words — their truths — may inspire others who are facing loss to consider writing as a path toward healing, release, and self discovery. I am so pleased to hear that Transitions Life Care is using writing workshops to help the grieving. I have experienced the healing powers of writing and still find days I need to “get it out” in writing fifteen years after my first workshop. Keep up the good work in offering writing workshops.